If you haven’t said either of of those things, I’m sure you’ve heard them! They can do it and you can as well. In fact, I think in most cases, families can spend less money and eat healthier at the same time! The majority of people I know, spend more than we do on groceries and buy less healthy foods! So many people want to change their eating habits and start buying more nutrient dense and less processed food, maybe you do as well, but it can seem overwhelming. You might feel there are so many changes to make and wonder that since you can buy generic brand processed foods for cheap – a lot of times just a dollar of two if it’s really affordable to switch. There are so many different definitions of what’s healthy, in this post and for our family I focus on whole ingredients, making food from scratch or buying products with minimal ingredients, fruits and vegetables, whole grains, no artificial sweeteners etc. 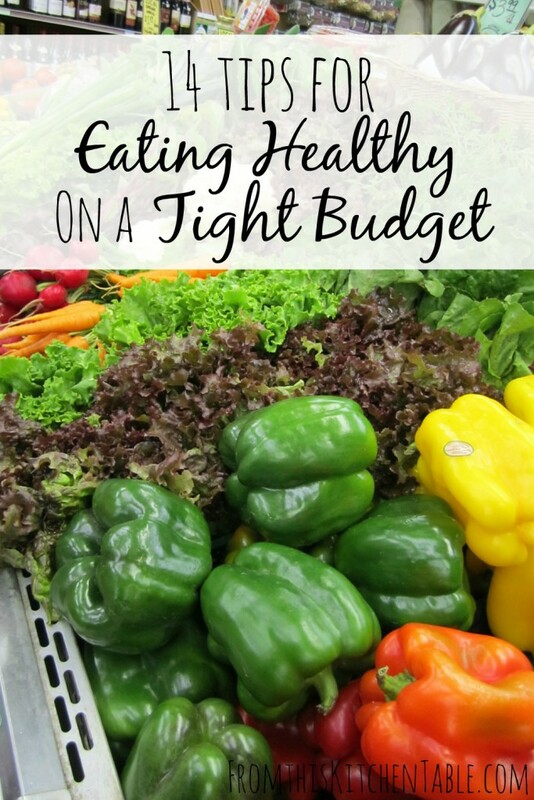 You can buy healthy food on a tight budget. These tips really make a difference. 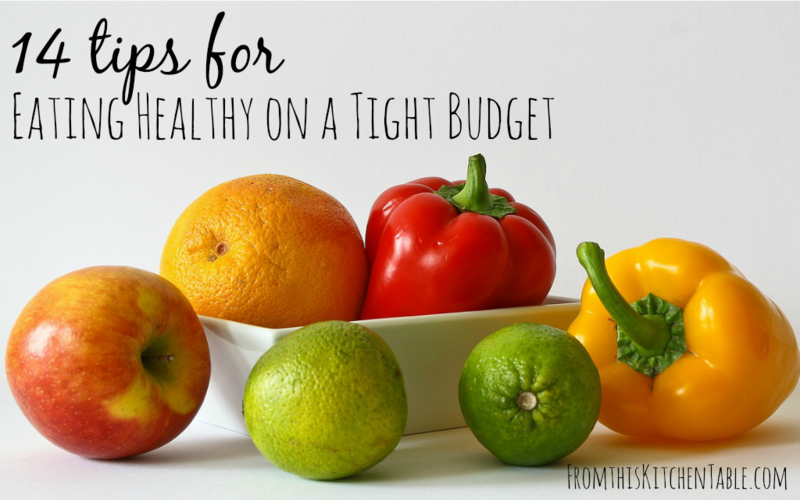 For added inspirations, be sure to check out the post on reducing your grocery budget. Don’t feel like you have to go and throw out everything in your pantry and refrigerator and start over. Transition one ingredient at a time. Replace your canola oil with coconut oil, olive oil, and butter. Buy another bunch of bananas instead of the chips. When your flour runs out, try whole wheat. This is a huge deal to me – I have an entire post on why it’s important. If you go to the store and just start putting things you think you need into the cart, you will spend a lot of money. Plan your meals and snacks so you know exactly what to purchase (but if you find an awesome sale or markdown be willing to adapt when you are at the store). The basics are almost always going to be cheaper than specialty ingredients. Don’t feel like you need to buy 10 different fats just because you’ve read about them. Stick to coconut oil, olive oil, and butter. Avoid the “healthy” convenience foods. Make bread, cook your own mac and cheese, mix up a marinade for the chicken, make muffins instead of buying Poptarts. Vegetables and fruit will make up a big chunk of your meals and snacks. Buy what’s in season and on sale. Also, don’t forget about the frozen produce. Sure, I love fresh produce but fresh green beans in the winter just aren’t happening. Don’t Feel Pressured to Buy Organic! If you can’t buy organic, it’s okay. Produce, even conventional, is going to be better for you than a bag of chips or a candy bar. Don’t let not being able to buy what you think of as best keep you from buying what is better. Free Range/Grass Fed/Pastured. . .! This follows the same advice as the produce. Sure, I think grass fed beef is the best, but if I don’t have access to someone splitting a quarter of a cow with me or I don’t find it marked down in the grocery store, my budget simply doesn’t allow it. Do keep your eyes open for great deals, but in the mean time feel good about cooking up your own chicken instead of buying lunch meat or browning ground beef instead of picking up taco bell. These foods are all pretty affordable. Buy several different kinds-of beans and lentils. Try quinoa. Have oatmeal for breakfast a couple times a week. I like meat but I also like these other foods and they happen to be a little easier on the budget so you’ll see them often on our menu plan. Plan to use those leftovers! I often have each meal I’m cooking twice a week and then there will be another meal that’s leftovers of the leftovers. Instead of eating the same meal twice in a week you could also plan to freeze the other half and pull it out at a later date. Not only do you not want to waste leftovers, you want to watch the dairy products, produce, potatoes, and onions and make sure you don’t let all the odds and ends go bad! Turn them into a soup or stir fry. Slice up the bell peppers and stick them in the freezer. Freeze the milk in cup portions. This is a continuation of don’t waste! The ends of the celery, pieces of onions and carrots, parsley that’s going bad etc – throw them into a zipped bag and keep in the freezer. The next time you are making stock, add it to the pot with the bones for extra flavor. Don’t assume local stores are the cheapest! If you can’t find local honey, order raw honey online (my favorite place for honey is Vitacost – they have an amazing price. If you sign up for Vitacost with my referral link, you’ll get $10 off your first order!) I also like to check (affilate link) Amazon . Don’t Be A Short Order Cook! Make one meal and have everyone eat it. In our house we all eat the same thing for supper. There’s no fixing something different for a child. It’s good for the kids and it’s good for the budget! Weekday lunches the kids eat the same thing and the adults do salads. Breakfast my youngest likes oatmeal and us other 3 eat the same thing. Having to buy ingredients to fix two separate meals adds up! Garden. . . If You Have a Green Thumb! Herbs are an awesome thing to grow. Fresh ones from the store are expensive. I’m about the worst gardener ever, and have yet to really succeed with planting, but my sister’s herbs flourish! Try tomato plants, squash, lettuce. See what grows well in your area and try something! Snacks really aren’t necessary. Even for kids. If we don’t have fruit with breakfast, my kids will have some midmorning and then around 3-4 in the afternoon they’ll have a little something. Fruit, veggies, nuts, popcorn, rice cake etc. It really varies. That’s it. There’s no snacking in the evening because they didn’t eat dinner. Snacks are easy to inhale and can be expensive. Plus, they often cause your meals to go to waste. 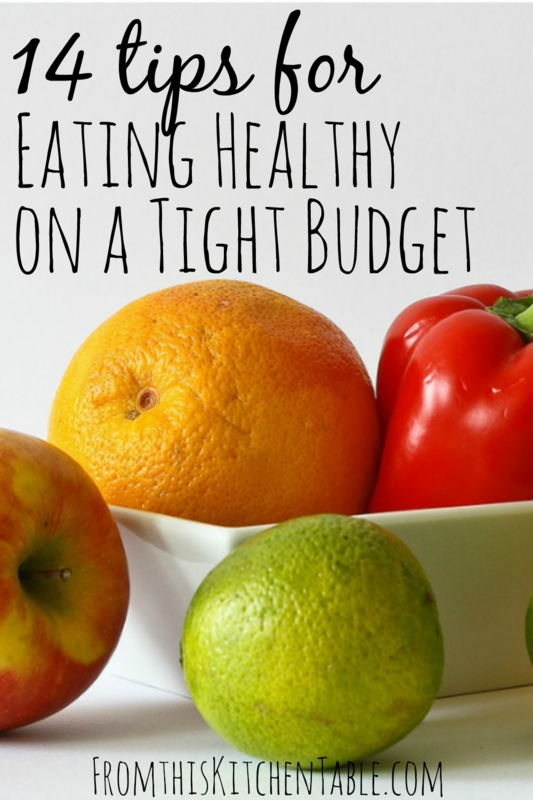 How do you handle eating healthy when you are on a tight budget? Any favorite tips to share? You can do it! Just take baby steps and keep plugging away. We are all doing the best we can. Thankfully there are lots of ways to save, if gardening was the only one we be broke and starved. If you enjoyed this post, we’d love for you to join our community on Facebook and follow us on Pinterest! 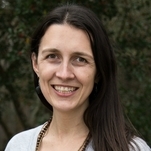 This entry was posted in Finance, Food, Uncategorized on April 16, 2015 by Deanna Michaels. Thanks for sharing! This makes me not feel so bad that I don’t buy organic or grass fed! Not sure why it has to cost so much to eat healthy. It’s a conspiracy…LOL! Thanks for the great tips! Things really can add up! I’m so glad we have an Aldi and someday I’d love to have a good farmer’s market. I like your ideas but I find that sometimes I just don’t want to cook. Any suggestions for those who don’t want to be in the kitchen most of the time? He he. I hear you. There are a lot of days I don’t want to cook either. Let me tell you, leftovers are my best friend – that’s one of the tips I share in this post on how to spend less time in the kitchen. I plan for almost every dish I make to serve 2 meals. Also, maybe have a couple quick back-up meals you can put together in minutes – jarred or frozen pasta sauce and noodles or breakfast for dinner etc. Whole-wheat couscous cooks in 5 minutes and is affordable if you can buy from a bulk bin or get a large package. In another 5-10 minutes you can chop and saute some vegetables or steam frozen vegetables, and drain and rinse a can of beans. Throw it all together and you’ve got dinner for under $2 a serving. Our grocery bill is on the higher end (or so I think? ), because we eat most of our meals at home. I’ve been trying to limit our meat intake and finding creative ways to incorporate eggs as our protein source in savory dishes. I made a lot of soup/chili centered around beans as they are so cheap but filling. Oatmeal and/or homemade granola for breakfast instead of boxed cereal. Boxed cereal can be so expensive! Food waste makes me nutty. I did a post on foods that costs as much as Ramen, good food is attainable for any one. Thanks for posting. Hello from Thrifty Thursday. Ramen is 14c/package here, so I am curious what else is that cheap! I’m going to your site to look for that post. That box of peppers was a steal! Thanks for sharing to try the farmer’s market. Ours is so small I seldom go but I should give it a shot again this year.